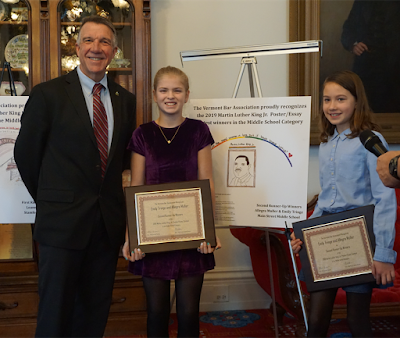 VBA Blawg: Congratulations to Our MLK, Jr. Poster-Essay Contest Winners! 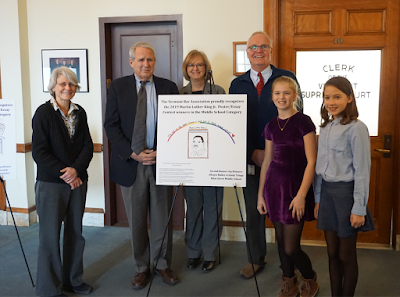 Congratulations to Our MLK, Jr. Poster-Essay Contest Winners! The Vermont Bar Association, in partnership with its Diversity Section and Young Lawyers Division, sponsored a Martin Luther King, Jr. Poster-Essay Contest to celebrate the life and message of the late Dr. Martin Luther King, Jr. Middle school students were asked to create a poster and write a short essay interpreting what Dr. King’s quote: “The arc of the moral universe is long, but it bends towards justice” means to them. 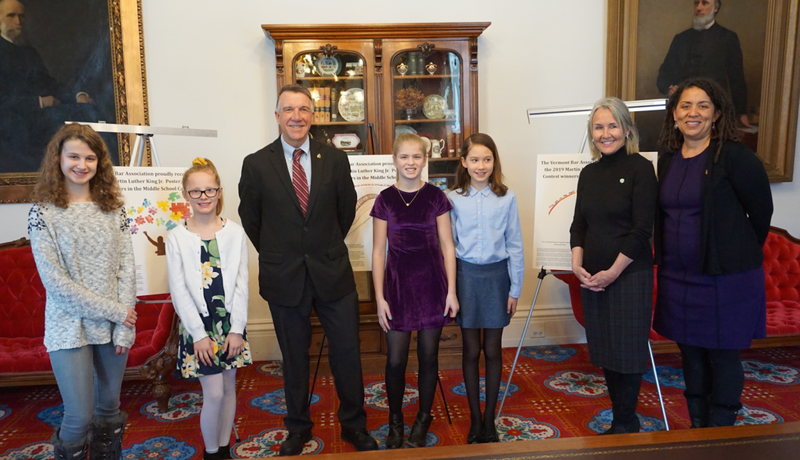 One winner and two runners-up were selected by the committee from the many creative and thoughtful entries received from all over the state. Governor Phil Scott presented awards to the winning students at the Statehouse on January 23, 2019. Elizabeth Cunningham, from Edmunds Middle School in Burlington, was presented with the first-place plaque and traveling trophy for her school. Leanna Jo DiCantio, from Stamford Elementary School in Stamford, received the first runner-up plaque and the team of Allegra Muller and Emily Tringe, from the Main Street Middle School in Montpelier, received second runner-up plaques. VBA’s Executive Director, Teri Corsones, welcomed the students, families and guests before the Governor spoke of the importance of Dr. King’s message. Governor Scott cited the “golden rule” to the guests and stressed the importance of being kind and civil to one another. 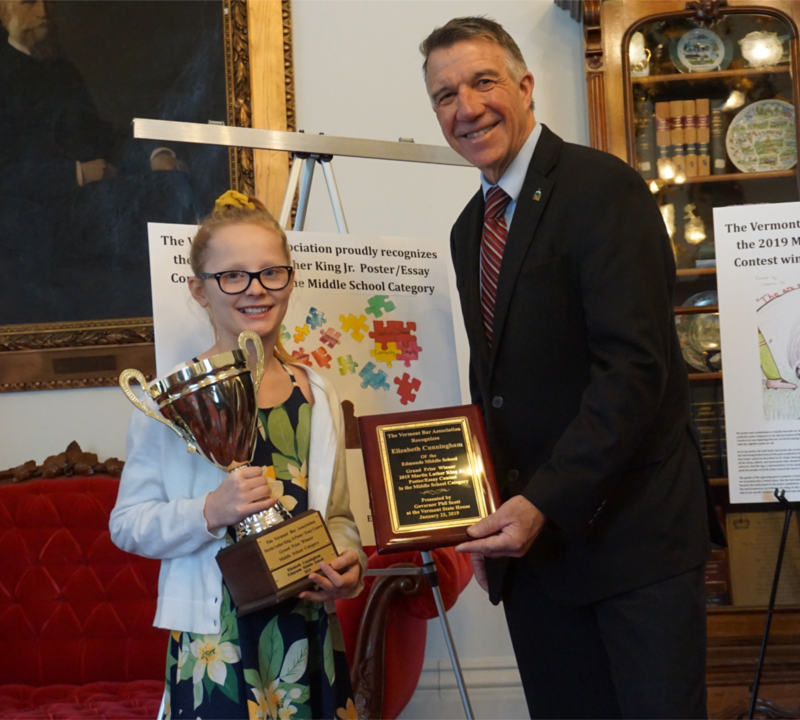 Before presenting each plaque, the Governor asked the students to describe their posters and essays. Despite the complex theme of the contest and the request for impromptu remarks, the students truly shined with their thoughtful responses. Contest winner Elizabeth Cunningham, age 11, described in detail how the puzzle pieces are small and dark at the onset, and included words like segregation, as Dr. King’s message was abstract and not resonating or taking hold with enough people at first, but how they grew larger, brighter and more connected through action, as they joined the words ‘justice, community, peace and integrity.” First runner-up, Leanna Jo DiCantio, admitted that her love of soccer helped form the soccer theme, which was an excellent symbolic image of bending toward the goal of justice and in her words “the goal of a moral universe.” Her family made the 3-hour trip the night before and stayed in the area. The Main Street Middle School team of Allegra Muller and Emily Tringe each took turns describing how the arc was depicted as a rainbow representing peace, justice, positivity and kindness and how we are all walking toward the end of the rainbow, to reach it eventually. When Governor Scott asked each winner how long it took them to prepare the poster and essay, the Muller-Tinge team remarked that they thought there was an “always” in the quote, as in always bends toward justice, so they ended up having to redo the entire poster! VBA Diversity Section member Jessica Brown added her thanks to the students for embracing the challenge and helping to share Dr. King’s message. The Governor presented the awards and posed for photos with each of the winning teams and the group as a whole. After the ceremony, the group of students and their families were treated to a Statehouse tour and then were invited to the Vermont Supreme Court where they were greeted by Chief Justice Paul Reiber. Chief Justice Reiber took some time to meet each winner individually, congratulated all of the students, and spoke to the importance of Dr. King’s legacy. He told the guests the story of his colleague the Honorable Jimmie M. Edwards who came all the way from St. Louis, Missouri to Vermont Law School on Tuesday for a Martin Luther King, Jr. celebration to speak about his work mending the communities surrounding Ferguson, near St. Louis. 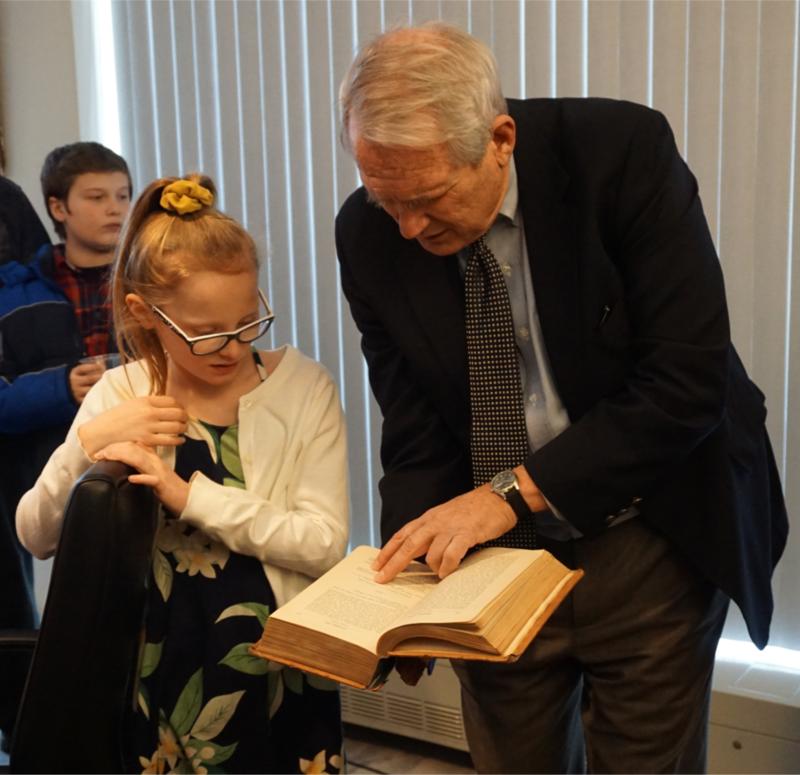 Amidst the inquisitive students, Chief Justice Reiber also described how decisions are deliberated, written and published. 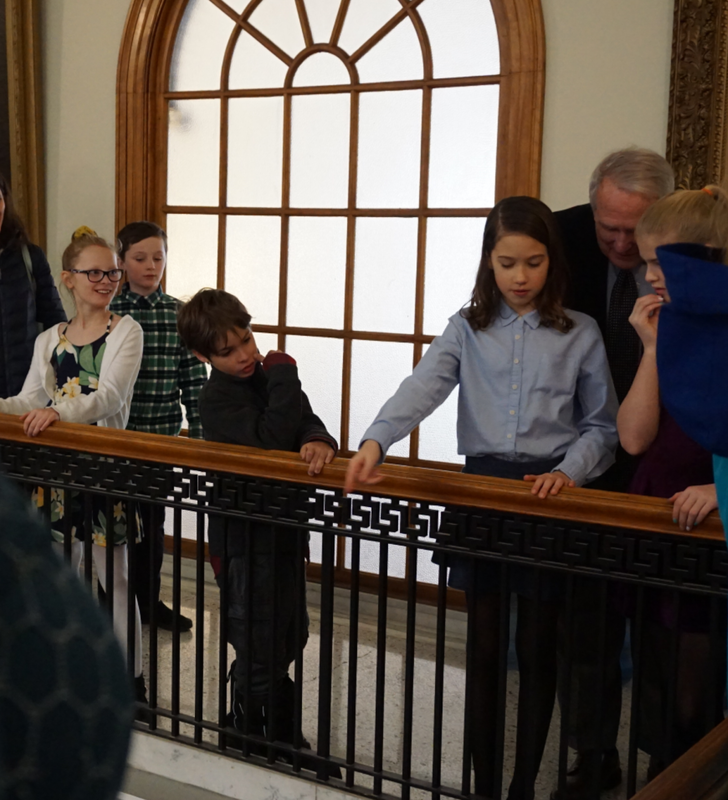 And for a most special treat, the guests were treated to a tour of the Court’s chambers, back stairway and the individual Justice’s offices and chambers. The students were fortunate to be able to meet four of the Justices and pose with the Justices for pictures. The students’ posters and essays will be on display at the Supreme Court building for the near future. Please scroll down to see the winning submissions and all the photos from the ceremonies. And click HERE to see all of the honorable mention entries. The VBA would like to congratulate all of the participants who submitted such excellent entries. Special thanks to Governor Scott, the Sergeant-at-Arms, and Chief Justice Reiber, as well as to all of their staff members for making the event so memorable for the winning students, their teachers and families. Parents and teachers should watch for notices in October for next year's contest which is destined to be another success!